My thanks to Matt Swanson for gifting me the guitar, to Drew Berlin of Vintage Guitar Auctions at Misty Morning Road, CA, USA who put the whole thing together, to Ron Mancuso who provided the venue and studio, fabulous food and drink at the Bootlegger, 7700 Las Vegas Boulevard whose family own the legendary Italian restaurant on the premises. Also, thanks to Taylor, the man who was my guitar tech and road manager for the weekend, and to David Plues and everyone else involved, especially the film crew and invited guests who were great, and a special thanks to Rob Newell who flew out with me from the UK to play bass with me along with the Stoney Curtis Band who made up the rest of the line-up. 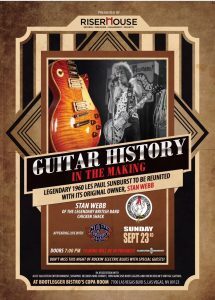 A much more in depth account of the Gibson Chicken Shack Burst Les Paul will follow in the next couple of weeks.